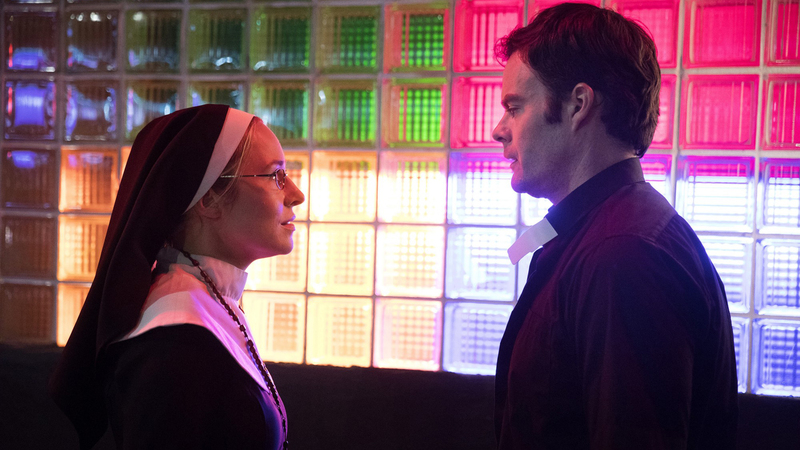 Ink editor-in-chief Kristina Dickey talks to Bill Hader and Alec Berg about their new HBO series, Barry. Hader plays Barry Berkman, a former marine who works as a hitman in the Midwest. Barry is sent to Los Angeles to kill a target, but is quickly derailed when after joining a theater class, he finds his new calling as an aspiring actor. Hader and Berg discuss what it’s like collaborating on a new project, Hader’s anxiety on Saturday Night Live that inspired his character, and the experience of directing for cohesion. Bill, on the show, your character Barry wants to start a new life as an actor, but has never acted before. This makes for some hilarious scenes with Henry Winkler as your acting coach. Can you tell me about that experience playing a bad actor who is both painfully uncomfortable and hilarious to the audience? 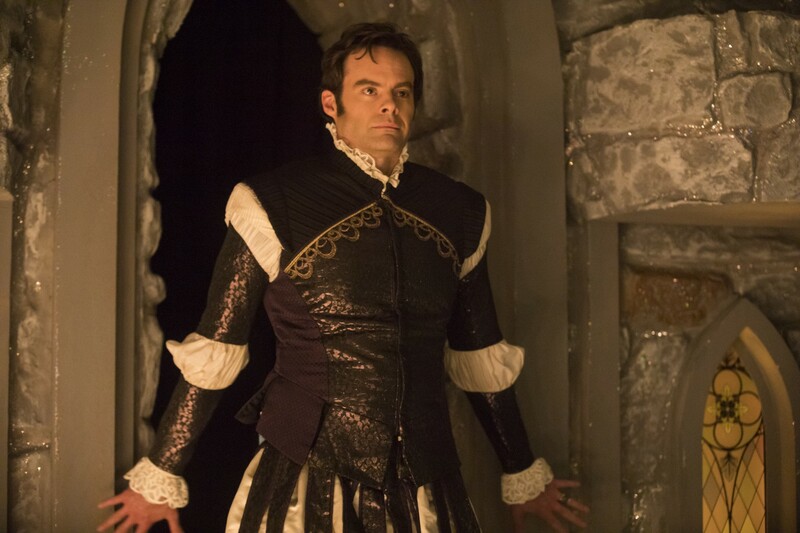 Bill Hader: I watch a lot of true crime shows because the reenactments on those shows are pretty bad – so that was helpful. But mostly, it’s just playing whatever the reality of that would be, and not thinking too much of the comedy. In a weird way, it kind of works. When you push the comedy it starts to feel like you’re reaching for something that might not be there. To Barry, acting is when you’d go around the class in junior high and read out paragraphs of To Kill a Mockingbird. That was the last time he did any sort of real acting. Acting to him was just speech class. Hollywood tends to depict excessive gun use in every genre – including comedy. Given that gun violence and mass shootings are pertinent and sensitive topics right now, did you feel that you had to portray guns carefully in this show? Hader: Yeah. With this story, Barry is a guy who kills people. And we had seen those movies a lot where it’s the hitman who doesn’t like his life, and it always treats the violence in this glib manner. There’s this idea that the violence has to be funny because you have to keep the tone that way. But violence is prominent in the world right now, especially gun violence, and it’s a world that he doesn’t want to be in. So portraying it just for what it is kind of helps story purposes but also kind of helps us portray a thing the way we feel about it which is: it’s a very sad thing. It’s very brutal and demoralizing, and so it was about this character who is a product of all this stuff, and he’s not wanting to be that anymore.The answer was just showing it for what it is. And making the guns sound real and when people die, making that look as real as what that looks like. Alec Berg: Yeah, we had kind of talked about the way we would shoot a lot of the violence as almost like security camera footage where it just is, without slow motion, and close ups, and like making it look cool. It should seem kind of sad and horrifying and uncomfortable because that’s what it is, and so the idea of glamorizing it is – we wanted to go the opposite. If you look atthe pilot there’s a scene where Barry shoots some guys and that all happens in one wide shot. Hader: Yeah, I think if it was an action movie … you would’ve seen those guys get shot, and it would’ve been this kind of rad thing of Barry shooting in slow motion. You would’ve seen the shells ejecting in slow motion. They’re just kind of fetishizing it. As I’ve gotten older, I find it weirdly inappropriate. Don’t get us wrong, we like action movies – I like Batman and Mad Max: Fury Road – but in this case, I think in comedies there’s this thing of like, “Hey we’ve got guns and let’s be irresponsible.” I just don’t think that really, in this day and age, that flies. How did you guys manage to merge your individual – and at times, differing – ideas into a show with such a strong, cohesive vision? Berg: It just was a lot of discussion. In writing it, it was just about getting on the same page about what the tone was, and fortunately, I think a lot of the same things make us laugh.There’s a line in the pilot that never makes anybody laugh. But one of our favorite lines is when NoHo Hank is talking about how he got the video of Goran’s wife in the hotel, he says, “I snuck a lipstick camera, similar to this one into the room.” And the idea that he’s brought the lipstick camera – but it’s not the same one. But he brought it just as an example of [what] the camera he used looks like – that always makes us laugh and nobody laughs at that. Hader: If everyone’s goal is making a good show then it’s all [about] what goes best in the show, and not about having what you necessarily want the show to be – your’e kind of the purveyor of it. Hader: The amount of times we can’t describe why we like or dislike something… usually the editor is the decider on that one but, you know, it’s fun. Berg: For the most part, I feel like we both kind of had the same idea in our heads. You know we have a room full of writers that we work with. Bill sits at one end of the table, I sit at the other, and they all kind of weigh in on stuff. But I think it was pretty easy from the beginning. What drew you guys to work together? Hader: Um… money. No, we had a mutual agent and the agent said oh you guys should work together and then Alec had a deal at HBO, and I had a development deal at HBO. When I had my meeting they said, “We want you to do a show with us, who do you want to work with?” I was like, well Alec Berg seems pretty cool. Berg: And he was right. Hader: And [the guy at the meeting] goes, “Well, Alec has another show called Silicon Valley, but I’m sure he’s free to come up with another show – and so that’s what happened. You based your character partly off of the anxiety you felt working on SNL and performing live every week. How much of the show is inspired by your life and experiences, and how much is fictional, or at least not derived from personal experience? Hader: I think it’s more of the emotion of it. I find that I’m good at doing impressions and doing voices and stuff, which is just an ability that I had growing up that I didn’t necessarily work on… and SNL’s the one place on the planet where you can get paid really well, well like okay, to do that. But the problem was that was on live television and I just didn’t have the mental power, and it just wasn’t good for me mentally or physically. I just got way too anxious doing that show. So it was more of that idea of Barry being good at killing, but it’s a thing that he’s kind of really great at but it’s destroying his soul because it’s awful. In that first episode when he’s at the table with everybody – that, to me, felt very much like me when I first got on SNL where I so badly wanted to be in a community of people – when I’m looking around and I’m seeing Tina Fey and Amy Poehler and Fred Armisen and Seth Meyers and all these people that are on the cast when I started – Will Forte, Rachel Dratch – and just [thinking], “How do I stay here? because I know it’ll enrich my life somehow.” Those are the things I relate it to. But I’ve never killed anybody or anything like that. Berg: But that’s the trick of writing a show, you try and find something that’s just a super true, relatable, real human emotion. As long as that human emotion is real and the situation is real, you can put that other stuff on top of it and people hopefully relate to it. Because the underlying story is true and real, it doesn’t matter if you’ve ever killed somebody – it still feels true. Hader: As an actor, I get sent a lot of scripts and that’s almost the number one problem – you could find a script that’s perfectly structured, has great writing, but the acorn of the idea, at its finite place, it just doesn’t have anything relatable. Are any of the other characters derived from any people in your lives or people you’ve worked with? Berg: None of them are one-to-one. 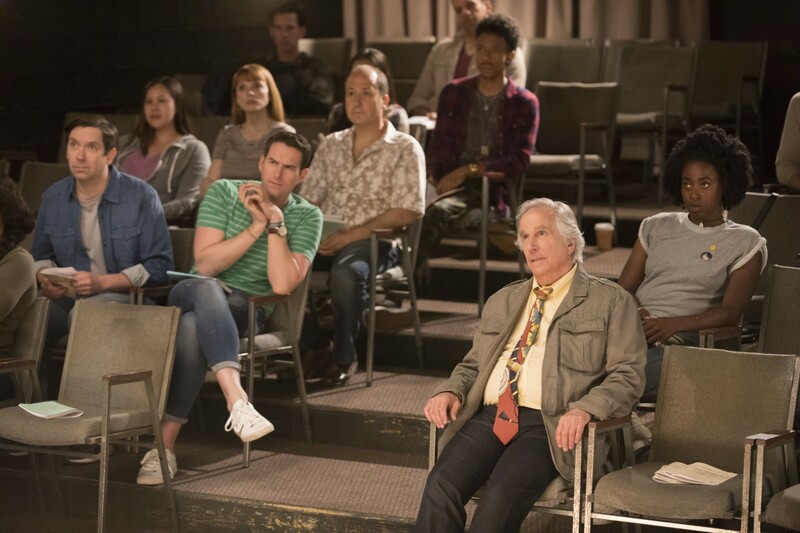 When we wrote Henry Winkler’s part, he was written as a much darker, angrier, meaner, more sadistic guy, and then when Henry Winkler came along and started performing that part, he’s so naturally warm and likeable that it became this totally different kind of interesting thing, where suddenly he was much more three-dimensional. Because he’s not just a sadist, you can tell there’s pain and there’s angst in him, as opposed to just being a monster. Alec, you’ve worked on classic sitcoms like Seinfeld and Curb Your Enthusiasm. But a show like Silicon Valley had some drama and introduced long plot arcs – it worked really well. What sort of balance do you see between those two types of show as it relates to Barry? Berg: Yeah, Silicon Valley’s much more serialized than– obviously you could watch Seinfeld episodes in any order and Curb was kind of the same way- but with Silicon Valley, you kind of have to watch them in order and Barry is the same thing. We kept looking at the whole thing as, this is one long, eight-episode story. Hader: Yeah, and we also look at the new season that way – we’re writing it now and it helps to have the whole season in front of you. You’re kind of looking at it as one thing. Berg: Because we’re on HBO and the seasons are shorter – going back to Seinfeld, we were doing 24 episodes a year for that show. You can’t write all 24 before you shoot them so the network TV game was insane because you’re shooting episode 3 while you’re writing episodes 7, 8, and 9 and you’re editing shows 1 and 2. You’re working on about ten or twelve different episodes in the span of a day. You’ve talked a bit before about the dichotomy between Barry’s job as a hitman and an aspiring actor, can you expand on that a bit? Berg: Well one thing we always talked about when we started writing and sort of landed on, as far as Barry is concerned, in the crime world the stakes are very high, they are life and death, but Barry has almost no dramatic pretensions about crime. Like he doesn’t get twisted up, he doesn’t get freaked out by it – shooting people is very boring. Whereas, in the acting world, the stakes really couldn’t be lower, but he’s so much more nervous about whether he can perform in this acting class than whether he’s going to get shot to death or not, which we thought was an interesting twist. You guys said you’re starting on season two, so looking back on season one, what are some things you guys want to work on or re-emphasize when you’re making the next season? How do you see the show expanding? Hader: Well we don’t want to give anything away, but you’ll see at the end of the season we really pinned ourselves into a corner. Berg: Don’t tell anyone but Barry dies in episode seven. 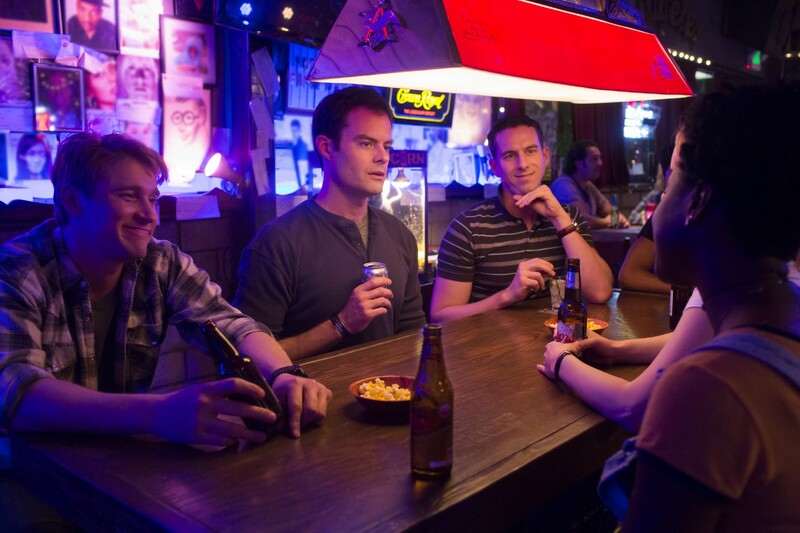 Hader: Yeah we don’t want anyone to know this, but Barry’s a ghost. Berg: It would be very hard, as you would imagine, to do a show called Barry without a character called Barry in it. Hader: Yeah, I’m not in the second season, but Barry Sanders is– and he’s not just in there so we can keep the title Barry, no matter what anyone says. Bill, this is your directorial debut, what other directors have you turned to for advice or inspiration in this experience? Berg: I was already stuck here. Hader: So yeah, he had to answer my questions. But really, the director of photography was the bigger help, and the production designer, and the costume designer – all the heads of your departments. Berg: Directing is a weird thing because when you’re on set as a director you’re not the best at anything you’re doing. The director of photography is better at lighting and lenses, the production designer is better at what color should that be or what the set should look like, and the AD is better at what order we should shoot in, and all the actors know the characters better than you do. I think it’s about every single person who’s there has their own idea of what the show is, and your job as the director is to make sure that everybody thinks it’s the same thing.